The busy bee, ya know? As you may recall, I grounded myself these last 2 weekends to nest and to make my house a home again. Know why? Because the opportunity to entertain is upon me. 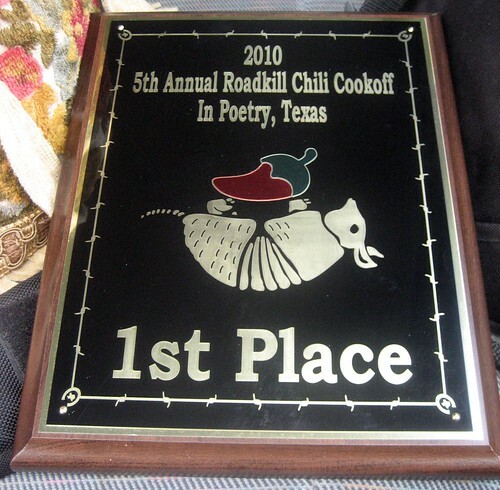 You see, I am hostessing The 5th Annual Roadkill Chili Cookoff this Saturday at my house. This is a little tradition I began, well, 4 years ago. And it's a hit! This year, we are expecting over 60 folks (at last count) and I don't know how many chilis will be competing. This guy (who places every year) caught his armadillo instead of running over it. Easier to clean without the tire grit all over it, I guess. Here are the pictures David took at the 2009 cookoff. Doesn't it look like fun? So, do tell...beans or no beans in your chili? Crackers or fritos? Sharp or mild cheddar cheese? Is your favorite roadkill armadillos, opossums or turtles? yes beans. yes no beans. yes crackers. yes fritos. yes sharp cheddar cheese. yes mild cheddar cheese. and yes on a dollop of sour cream...even though you didn't ask! no on the roadkill or at least don't tell me! #1. No beans..I have enough bloating problems as it is. #2. Fritos..the only way to go. #4. I've never had any of the main meats you've listed...I'm a simple cow girl myself. I've never heard of bacon salt, but it wounds wonderful! I have a good recipe with bacon for you...I'll have to post it. Have fun at your chili cook-off. I like beans, fritos, sharp cheese, and beef or maybe turkey if I'm feeling especially healthy. #2. I like frito chili pie but that's a different dish. For the real chili experience, crackers on the side. #3. Sharp like Angelique's wit! #4. Believe it or not, I've eaten all three of those, but not in chili... as far as I know. Looking forward to it, my love! Janet, funny you should say "or don't tell me". I can't tell you how many wild game (deer, elk, whatever) chili has shown up and folks are eating away til they hear what it is...then they get all goofy. Sharp like your wit, Angelique. I like it! FringeGirl, it's a chili recipe with bacon? I'll eat anything as long as I don't know what it is! I'm a bean gal, and I like my cheese sharp, just like my tongue! I like it with or without beans, definitely Fritos, sharp, mild, hot or not...I love chesse, the more the better! Oh, and I don't want to know what the kill of the day is...I just eat and don't think about it! Anne, What? Eat pets? Never! But, we will use the barking dogs as target practice, so they better stay quiet. jk! Susan, if you bring it, we'll eat it! beans. fritos. sharp cheddar. deep woods off. and.......... EEEEEEUUUUUUUUUUUUUUUWWWWWWWWWWWWWWWW!!!!!!!!!!! I need identification of all meat products prior to consumption. There ya go, havin' all the fun again! Without beans it's just barbeque! Lots of cheese, a dollop of sourcream....crackers or fritos....I prefer beef or turkey..even chicken, even though I've eaten lots of different wild game. Have fun!